On behalf of the board of the German Society of Ophthalmology it is an honour and a pleasure to welcome you to our annual meeting, which this year is being held as a joint meeting with the SOE, the Association of European Ophthalmological Societies. The DOG received the SOE Councils authorisation to hold the meeting in 1998. 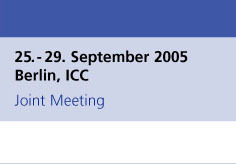 Berlin is naturally delighted to be the chosen venue for this European Ophthalmology meeting, particularly as the first impulse for European Medical Meetings originated here under the patronage of Albrecht von Graefe more than 150 years ago. The scale of the joint congress, with European and international colleagues represented from more than 60 countries has made it necessary, as on previous occasions, to hold the meeting at the ICC Berlin (International Congress Centre) under Berlins famous Radio Tower (Funkturm). In the last few years a large number of new topics have emerged in basic sciences. The integration of these into practical clinical tasks has certainly created significant challenges. The emphasis of the meeting attempts to tackle four exemplary subjects: Age-related macular degeneration; the evaluation of glaucoma diagnosis and therapy, imaging procedures in the anterior segment and the description of the retina and the subretinal structure and possibilities of improving visual acuity using refractive surgery or cataract surgery. Presentations by the four keynote speakers will be made on each of the four days of the congress from 12:30 to 13:00 hrs. Individual aspects of various ophthalmological sub-specialities will be discussed in more than 60 symposia, and courses will consider their implementation in day-to-day clinical practice. More than 1000 abstracts have been submitted and evaluated by a European Programme Commission. Interest from colleagues from the extended EU is extraordinarily large and shows that we can expect further demands of this nature in the future. Colleagues from Russia, the Arabic region and Asia will be contributing substantially to the meeting. Interest from Africa - traditionally integrated in the French annual meeting - will also be accounted for in our international symposia. It is also worth mentioning that for the first time at a European Congress, American colleagues will have the possibility of obtaining Continuing Medical Education (CME) Accreditation points which are obligatory for them at home. The Keynote lectures deal with the surgical treatment of age-related macular degeneration, from proof of principle to practical proposition, and continue with the recommendations of the European Glaucoma Society for the clinical management of this heterogeneous disease group. New imaging techniques, which, with the help of a new software programme, enable both precise diagnostic conclusions of diseases of the anterior eye segment to be made such as, confocal microscopy of the conjunctiva, as well as also depicting the retina and choroidal membrane structures is the third subject. Finally, an attempt will be undertaken to bridge cataract surgery and the relatively new refractive surgery to form an uniform concept, i.e. development of an overlap of both methodical approaches. In addition, a number of symposia by companies will also be held. Large meetings, such as this one, could not take place without the support of industry. We are therefore especially thankful, that the industry is prepared to support an interaction of this magnitude and at the same time present us with the newest innovations and developments. In its present form, with its numerous sections, the DOG has developed into a broad, consensus proficient scientific alliance, which at this meeting can expect attendance of 5000 members. In the near future endeavours must be made to harmonise professional political interests in Europe and to create a forum which places the appropriate value on the medical professionals in both clinics and practices. It must be of the highest priority, for all of us, that this goal is clear to patients, health insurance companies, the political establishment and to other medical disciplines. Finally, amid all the scientific activity, neither personal connections, friendships or cultural exchanges should be sacrificed. The social programme is meant to confront you with some of the interesting cultural aspects of Berlin highlighted by the evening in the Berlin Philharmonic Hall with the Philharmonic Jazz Band and the twelve Cellists. I hope that you will return home with good memories after a successful trip to Berlin and a memorable meeting.